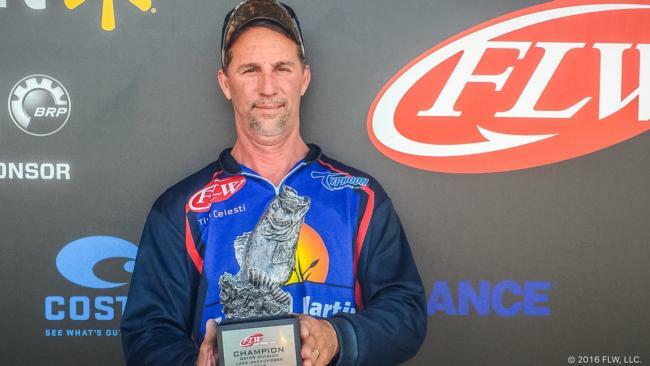 Tim Celesti of Margate, FL weighed a five-bass limit totaling 22 pounds even Saturday to win the FLW Bass Fishing League (BFL) Gator Division tournament on Lake Okeechobee presented by Power-Pole. For his victory, Celesti took home $6,300. Celesti said he punched mats within a five-acre stretch on the north end of the lake. He said that he preferred water that was stained, but still clear of debris. Celesti said that he used one bait – a June Bug-colored Gambler BB Cricket – to catch his stringer of bass. “I did my best to really get the Cricket up under the mats,” Celesti said. “I would hold it up high and let it drop after about 10 seconds. The bass would eat it and then just sit there. You could hardly feel the bite. It was like you had to give them time to come and look at it, and then drop it on their nose. The Florida angler said he targeted a single mat around 12:30 p.m. and caught a 4- and 7-pounder within ten minutes of each other to cap off his winning stringer. Kenneth Harris of Zolfo Springs, Florida, caught the biggest bass of the tournament in the pro division, a fish weighing 8 pounds, 15 ounces and earned the day’s Boater Big Bass award of $1000. David Bozeman of Ocala, Florida, weighed in four bass totaling 13 pounds, 7 ounces Saturday to earn $3,000 and win the co-angler division. Caldwell caught the biggest bass of the tournament in the co-angler division, a fish weighing 6 pounds, 3 ounces and earned the day’s Co-angler Big Bass award of $500. The top 50 boaters and 50 co-anglers based on point standings will qualify for the Oct. 13-15 Regional Championship on Lake Seminole in Bainbridge, Georgia. Boaters will compete for a top award of a Ranger Z518C with a 200-horsepower Evinrude or Mercury outboard and $20,000, while co-anglers will fish for a new Ranger Z518C with a 200-horsepower Evinrude or Mercury outboard.